On June 7th Steve Jobs introduced the iPhone 4, and the tech blogosphere went wild, covering every little nuance of the latest smartphone from Apple. At some point during the day, I’m not really sure when, Microsoft got the bright idea to make a big announcement also … and crickets chirped. Microsoft has been beta testing online versions of its Office suite of programs for some time now. By the company’s own admission hundreds of thousands of people were involved, all of them giving feedback to the company before the final launch. Always a good idea to be sure, but after a lengthy testing period, don’t you want to launch with as much fanfare as possible? Wouldn’t you like to be the center of attention? Apparently in the care of Microsoft, a blog post will suffice on a day you know that the news will be all Apple, all the time. All of that aside, by heading over to Office.Live.com, and logging in with your Live account, you now have access to Word, Excel, PowerPoint and OneNote if you live in the US, UK, Canada or Ireland. More territories will be added later, but for now it is limited to these four. 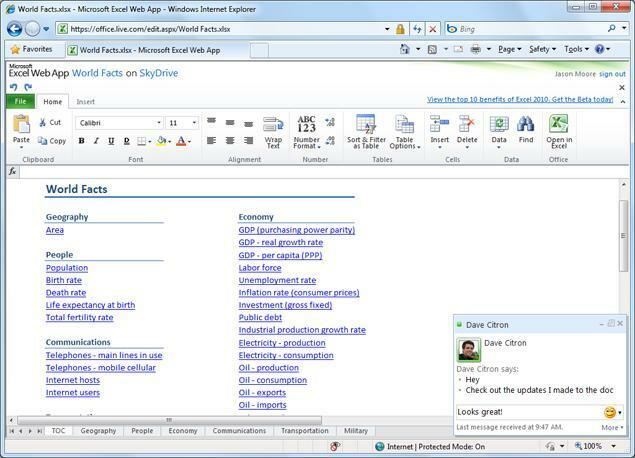 The online version of Office is powered by Silverlight which gives you the ability to drag-and-drop your documents into your online documents folder. You also have the option of creating new documents in any of the four programs, so if you’ve never used Office before, you can give it a start now. Once you’ve got documents uploaded or started, you can invite others to work with you in real-time on them, and thanks to the inclusion of a built-in version of Messenger, you can easily communicate with one another. If you’re going to be going offline, and you have Office 2010 installed, you can click a button like “Open in Excel” to immediately transfer the document to your local copy of the program. Overall it looks like a heck of an effort, and as a heavy user of Excel, I’m thrilled as can be that I can now work on my spreadsheets from anywhere with an Internet connection. You can also access your Word and PowerPoint files via most mobile phones, but you will only be able to view them. Still a nice feature if you forget something back at the office and need it on the go. There has been no mention as of yet that I have seen of space limits or potential pricing (if there ever will be). It’s a great start to an obvious competitor to Google Docs, but it still would have been nice to see Microsoft make a bigger splash about its launch. Perhaps someone needs to talk to their marketing department? What say you? Have you given Office.Live a try yet?